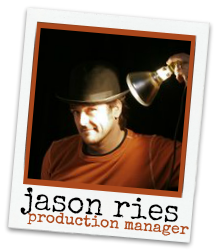 ​Jason is a director and designer intrigued by the relationship between text, movement, space & modes of illumination. Since moving from San Francisco to Boston in 2004 to partner with choreographer Karen Krolak and Monkeyhouse, he has worked as Resident Designer on virtually all company work since - with particular involvement with the design of full-length movement/illumination creations such as Always and a Day, & Now What?, and Æ (as part of 2010’s Dance at the Fells). He has also been with Actors’ Shakespeare Project in various production capacities since the beginning of the 2006-07 season, including lighting design for Love's Labours Lost, Much Ado About Nothing, Living in Exile and scenic design for The Taming of the Shrew and Henry IV:Parts I &II. From 1997-2004, he was a constant at EXIT Theatre and the San Francisco Fringe Festival, where he was fortunate to create projects with numerous like-minded artists with an interest in exploring ways of combining dance and drama. Among a variety of proud moments with award-winning itinerant theatre companies, some standout experiences there were regular collaborations with Mark Jackson and Art Street Theatre (IO! Princess of Argos!, Messenger #3, Jacque du Bon Temps), Meredith Eldred and Misery/Loves Company (Sincerity Forever, Get Me Rodd Keith!!! ), and an effort with Ms. Krolak on a pastiche of excerpts from Trevor Allen’s The Creature, produced by FoolsFURY. With Ms. Eldred, he first began working with Suzuki and Viewpoints trained artists and was given opportunity to fully incorporate design as an integral part of the evolution of work. and together they instigated and staged a personal favorite - the ensemble devised piece, in3. Jason has trained in Latvia and Ukraine with director Sergei Ostrenko and has also been inspired by his studies in neon sculpture with Christian Schaeffer. Through his explorations in neon, he has found a new way to explore his fascination with different configurations of light distribution, movement and illuminating the architecture of the human body.